Happy Monday! It's time for a new Mojo Monday sketch. I used the layout's large panel to create a springtime scene with stamps from Mama Elephant. I colored the raincoat wearing child and umbrella images from the Chance of Rain set with Copic markers, then carefully cut them out with my sharp scissors. I used foam tape to adhere the images to a blue panel with a die cut shimmery white cloud strip at the top and a torn edge green strip for grass at the bottom. 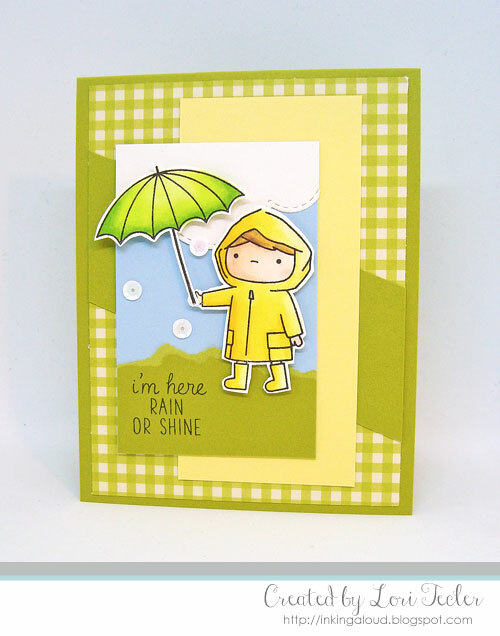 The "I'm here rain or shine" sentiment was stamped on the green part of the panel in black ink. I added a trio of white sequin raindrops for a whimsical touch. The image panel was adhered to the left side of a coordinating yellow cardstock panel. I adhered the pieces to a green card base covered with a green gingham panel with a diagonal solid green strip across it. I enjoy sharing my creations with others and using my teaching background to help people to create handmade cards and gifts. All content on this site (text and designs) is © Lori Tecler. Content shared on this site is intended to be used for personal inspiration only. Thank you! Look Here for More Posts About . 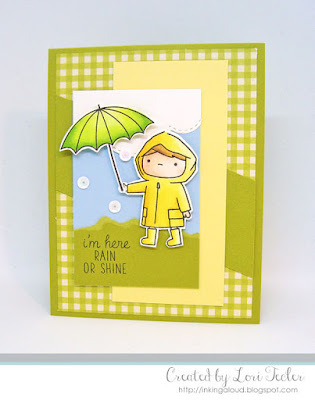 . .
Inking Aloud is a personal hobby blog with the sole purpose of sharing paper crafting projects. It is non-profit and does not make use of any personal information shared in any comments or any third-party applications such as email subscription services, or by blog hosts (Blogger/Google).